Queen front man Freddie Mercury was a larger-than-life showman in every sense of the word. The notion of an actor capturing his stage presence, let alone his fiery persona, in a film has long seemed as daunting a task as playing the piano solo of “Bohemian Rhapsody” while blindfolded. Enter Rami Malek. It’s not just fantasy. With gusto and soul, the actor delivers one of the most outstanding performances of the year. He single-handedly turns the formulaic biopic Bohemian Rhapsody into a fascinating character piece. This is far beyond an imitation — though if you placed side-by-side photos of Mercury and Malek in the white tank top and jeans ensemble from that 1985 Live Aid performance, you’d be stunned at the physical similarities. The Mr. Robot star embodies the very spirit of the flamboyant, often tortured musical savant. Forgive me for using the obvious pun, but it’s lined up so perfectly: He will rock you. The movie itself, however, won’t make you stomp your feet and clap your hands in unbridled joy. (At least not until the end but I’ll get to that in two minutes.) Going in, I knew very little about Mercury’s upbringing in Zanzibar and his relationship with his family and how he channeled his unique artistry. Bohemian Rhapsody doesn’t bother exploring any of these threads. Might as well Wikipedia him for more in-depth answers. We go straight to 1970 London, where a 20-something Mercury — then still using his given last name of Bulsara — introduces himself as an aspiring singer to struggling musicians Brian May (Gwilym Lee) and Roger Taylor (Ben Hardy). 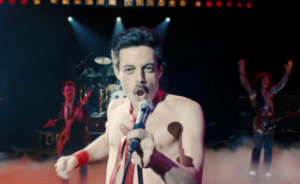 Along with bass guitarist John Deakins (Joe Mazzello), they soon form a rock band called Queen. Mercury is the only one of the four with a discerable personality, and he knows it. “The name is outrageous, and nobody is more outrageous than me!” Mercury explains to his girlfriend Mary (Lucy Boynton). Soooo the dialogue is not going to lead to a screenplay award. Indeed, much of the rise-and-fall-and-rise narrative will seem familiar to anyone who’s ever watched a VH1 Behind the Music episode: See the guys bask in the success of their first hit! See the guys tour the U.S. for the first time! See the guys bicker over minute details in the recording studio! See the guys prove all their professional doubters wrong! See the excess and the descent! Meh. The scenes don’t even look good: The cinematography is mostly out-of-focus and poorly lit, which will lead audiences to wonder just how much work director Bryan Singer contributed to the project before he was fired mid-production. Many will also grumble about the PG-13 rating, and the decision to sanitize Mercury’s sexuality and drug use. It’s the reason why Sasha Baron Cohen, long attached to the role, has said he dropped out. For the record, Mercury — who died of an AIDS-related illness in 1991 — does reveal to Mary that he is attracted to other men. He passionately kisses some of them. But personal conflict is minimal, compared to, say, Emma Stone’s Billie Jean King in last year’s Battle of the Sexes. There’s simply no time for quiet introspection: With the decision to compress Mercury’s life and career into a short 15-year span, many of his crucial milestones are awkwardly shoe-horned into the plot. Just a hunch that Mercury didn’t really introduce his new lover to his parents on the day he performed the biggest concert of his career. Queen fans will — and should — look past these flaws. That’s because what Bohemian Rhapsody does so magnificently is showcase the music in all its splendor. The hits all here, folks, from “Somebody to Love” to “Under Pressure” to “Another One Bites the Dust” to the groundbreaking operatic title track. The latter is the beneficiary of an excellent inside joke thanks to a cameo from an unrecognizable Mike Myers as the disapproving label head. (We’re not worthy.) Malek lip-syncs all the tunes, an inevitable choice given Mercury’s unparalleled four-octave vocal talents. Besides, the tactic worked for Angela Bassett in What’s Love Got to Do With It and Jamie Foxx in Ray. Each of these classics build to Queen’s rousing, chills-inducing performance at London’s Wembley Stadium for the Live Aid benefit in July 1985. Malek doesn’t just move across the stage like Mercury for the iconic 15-minute set; he makes love to the mic stand and adoringly basks in the spotlight. It’s a scene that can’t be denied. 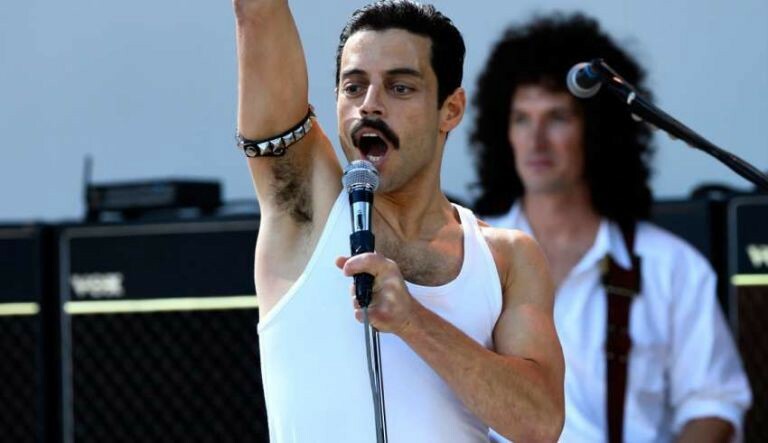 And, frankly, if you are not cheering along with the crowd as Mercury belts out an ultra-satisfying rendition of “We are the Champions,” then a doctor should check your pulse. Somewhere, an outrageous artist knows that his Queen movie rules.